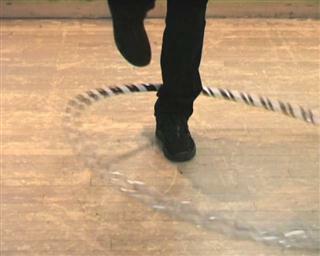 Once you can hoop on your foot you can step inside a hoop on the floor and kick start it. No need to bend down and pick up your hoop anymore. 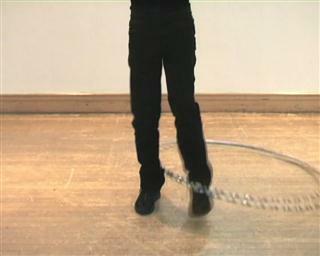 There are various techniques for floor or kick starts. I'm going to look at two variations here. 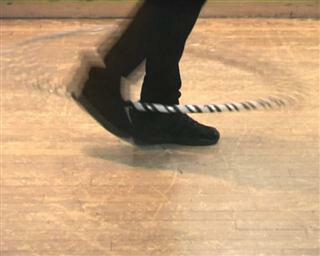 The heel back and then the foot swing. 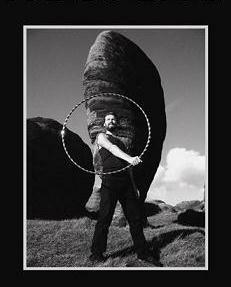 Firstly you need to get the hoop into the right position to start. 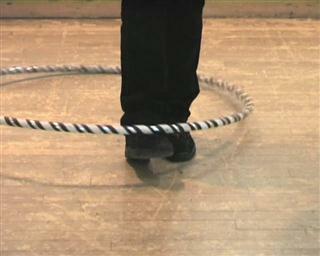 The hoop needs to rest on top of the toes of foot two. 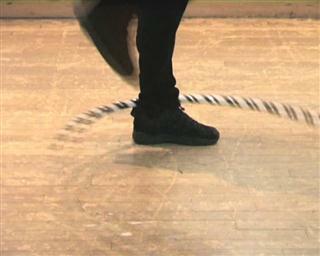 Foot one is in front of the hoop. 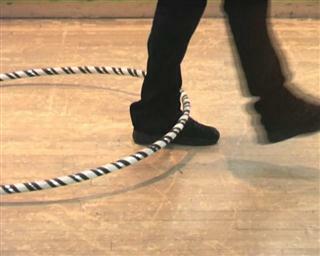 Foot one swings forward so that it can kick the hoop with the heel. Foot one swings back hitting the hoop with the heel. 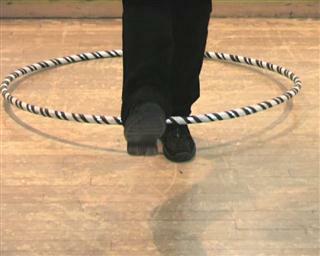 The hoop will then start to circle around foot two. Drop foot one into the space next to foot two. 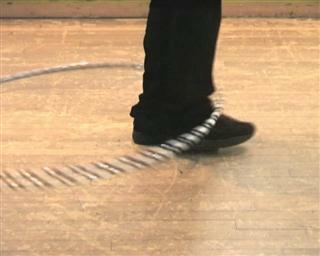 You want the hoop to come onto your toes. 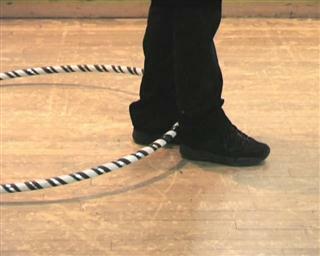 From here you can use the hoop's momentum to start foot circles. 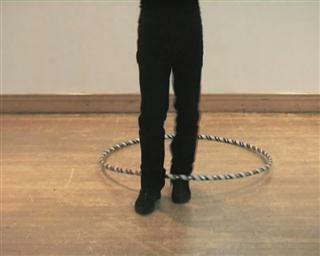 This move can make your heel a bit sore if you use a heavy hoop and it's best done on a smooth floor. 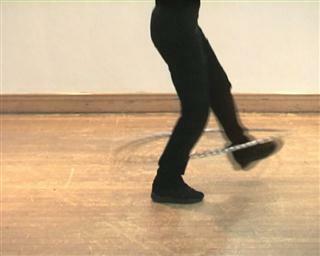 The foot swing version is better for use on grass and doesn't hurt your heel but it could be considered less stylish. Starting in the same position as the heel back. 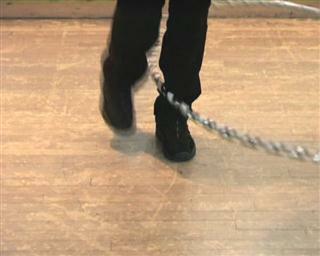 Foot two swings out and round carrying the hoop forward. The swings round to the front. You're going to have to hop over the hoop. Foot one hops into the space. 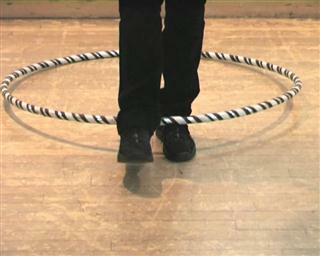 The hoop comes onto foot one and you can go into foot circles. There should be more momentum here to keep the hoop going.